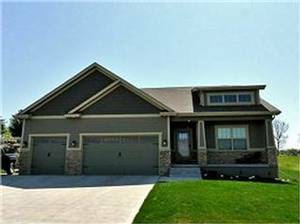 Like-new open concept ranch home built in 2013. As you walk in you will notice the beautiful hickory floors throughout the main level with 2 custom built-ins at each door. 2 very large bedrooms on the first floor with custom closets and en-suites for both. In the kitchen there are custom hickory kitchen cabinets and granite countertop with center island sink. There is a slider that leads to your deck. There is also a cozy gas fireplace with beautiful surround as well. Laundry is also on the main level. Downstairs you will find a large wet bar with fridge that stays, another large family room and a bedroom with full bath. Large, separate storage rooms are also downstairs. Enjoy a beautiful backyard with 12X24 deck. Call the agent to get in today Brook Doheny 515-314-0647. Terms: Cash , Conventional , FHA , VA , USDA Rural Dev.